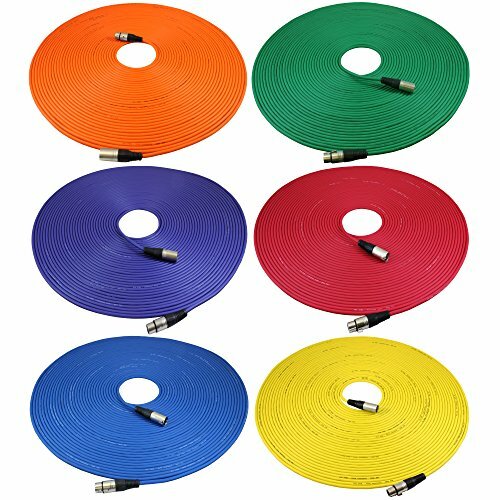 6 PACK of Professional Series Noise Free Mic Cables. They have a thick, high quality, flexible rubber jacket. They are heavy duty Noise Free "True Balanced LO-Z" and have 3 pin XLR connectors on each end. These cables have dual insulated copper conductors plus they are shielded. They are hand wired & hand soldered and have high quality metal ends. They have a double strain relief on each end (internal Tri-GripTM and external rubber booty). As you can see in the above picture, the female locking end has a rubber grommet. This allows the cable to snap into place without being loose and sloppy like most other cables you may find. This 6 PACK comes with 6 different colors as shown. If you have any questions about this product by GLS Audio, contact us by completing and submitting the form below. If you are looking for a specif part number, please include it with your message.